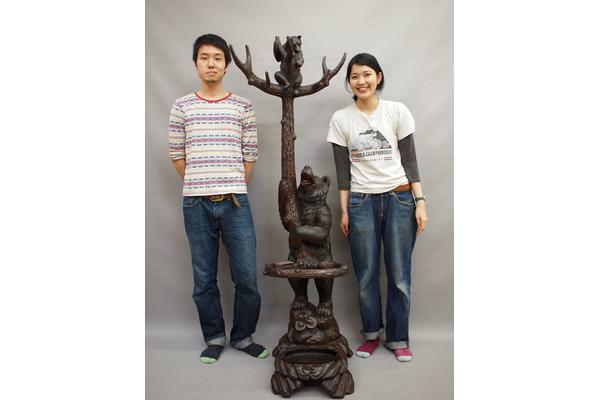 In the beginning of January, Manami Shinagawa and I got a carved object, because we had already learned wood carving skills in Japan. 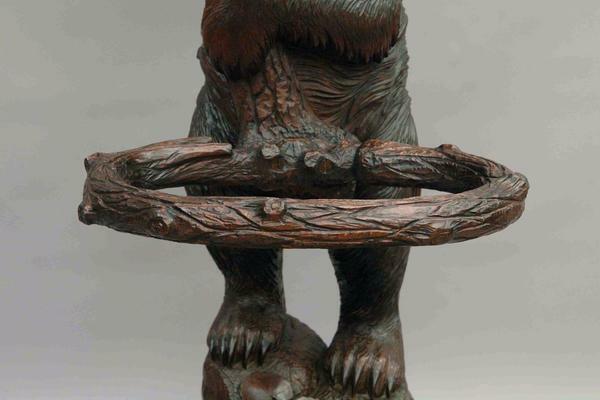 This fine hand-carved bear sculpture is a Black Forest umbrella and hat stand which originated in Brienz, in the middle of Switzerland. 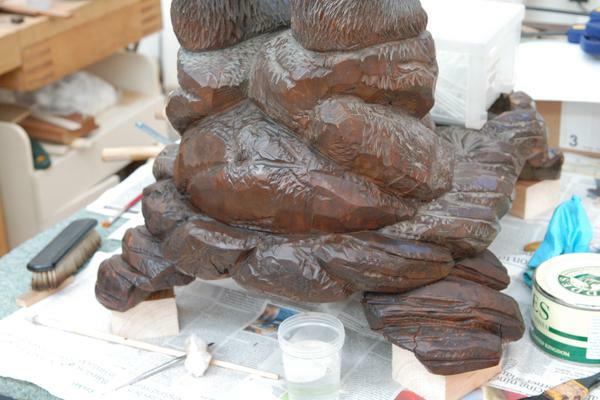 A chunk of lime wood was carved into a scene: a parent bear is clutching a tree trunk while the cub playing in the branches. Before treatment: Underneath of branches. Before treatment: Brass oval ring. Brienz used to be a picturesque rural farming village. 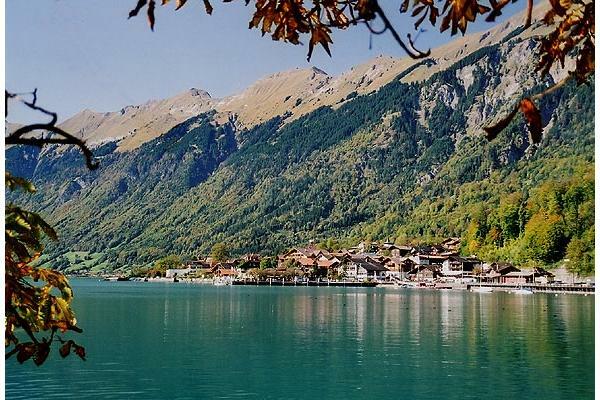 However in the middle of the 18th century, a poor harvest occured in Brienz. The people living there rack their brains to think of how to feed their families, and they decided to make carvings to sell to tourists. These carvings became known as "Black Forest carvings." In those days, large number of Victorians came to Brientz to see the nature, and they bought these rare sculptures, which were designed so they could be disassembled for travel. I think this object is one of these sculptures brought by the Victorians. Brienz scenery. Image from Wikipedia. 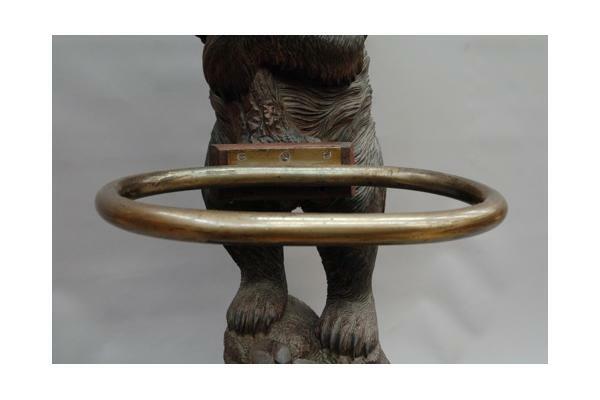 The current brass oval ring was for umbrellas, screwed on to the original part of the sculpture with a rectangular piece of stained oak that was not original. 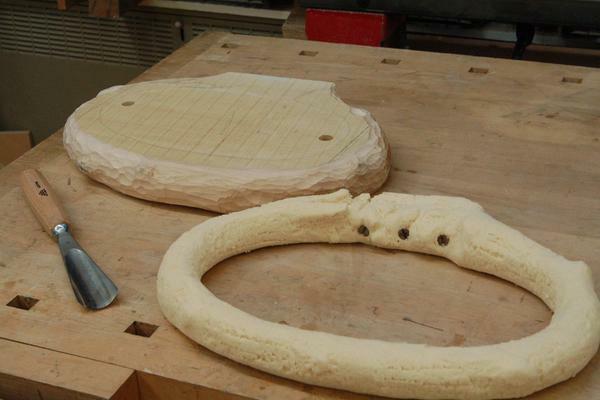 So I needed to carve a replacement hoop to blend into the trunk and the style of carving. There were also a lot of areas with gaps, missing parts and removed finishing that needed treatment. There were missing areas of original material on the underneath of the both sides of the larger branches. 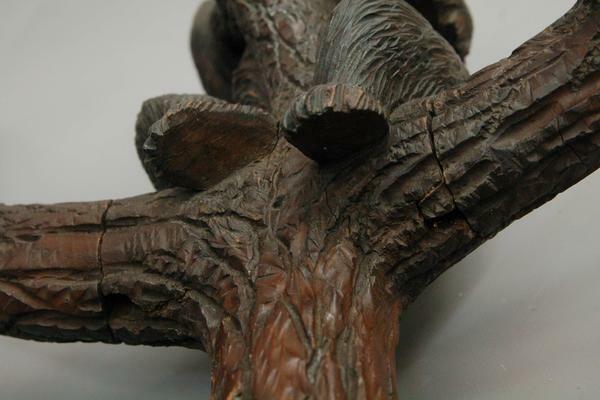 The larger right and left branches attach with a wooden screw, for disassembly, however at a later date someone glued the screw into the main trunk. These screws are now loose. 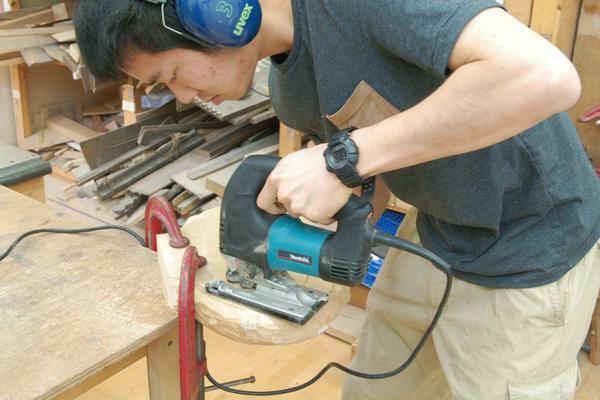 Manami disassembled the loose branches, and removed the old glue from their joints. 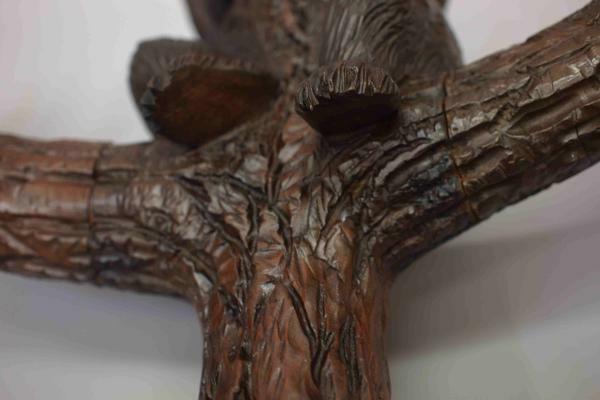 After that, she glued the two smaller branches on the top with a mixture of animal glue, microballoons, and earth pigment. Microballoons are tiny glass bubbles that can be used to bulk a fill material. The missing areas under the bigger branches were filled with pieces of lime wood. Because the entire carving had shrunk since its making, the branches no longer lined up in the correct place when they were screwed in all the way. I added a piece of lime veneer to the edge of trunk so that the branch would stop turning sooner, and the carving would match. 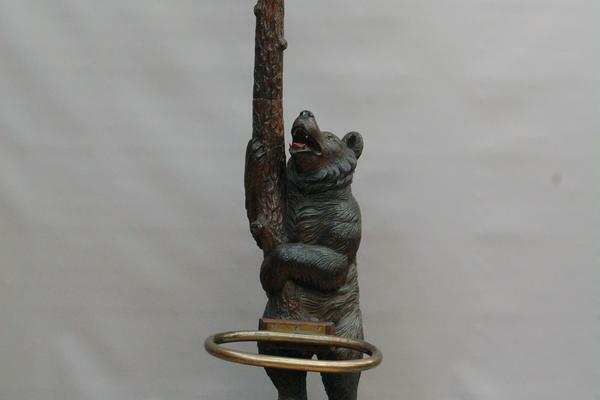 The new umbrella hoop was carved from a plank of lime wood in the style of the sculpture. 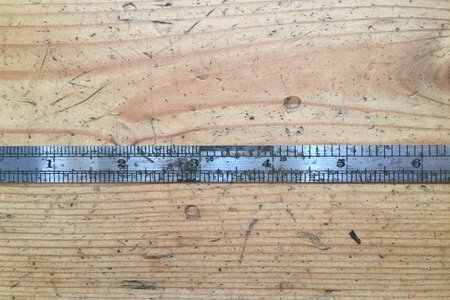 Initially my tutor and I went to an antique shop to measure the hoop of a similar type of stand. 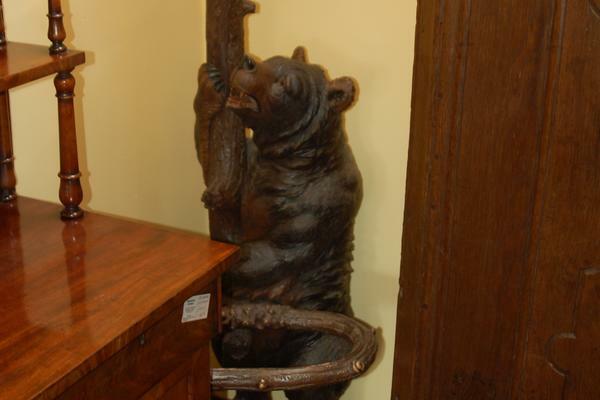 An example of stand at the antique shop. After measuring. I made a model using styrene foam. The stand in the shop is larger than our stand, therefore the foam model was made slightly smaller and thinner than the example stand to blend in our shorter stand. 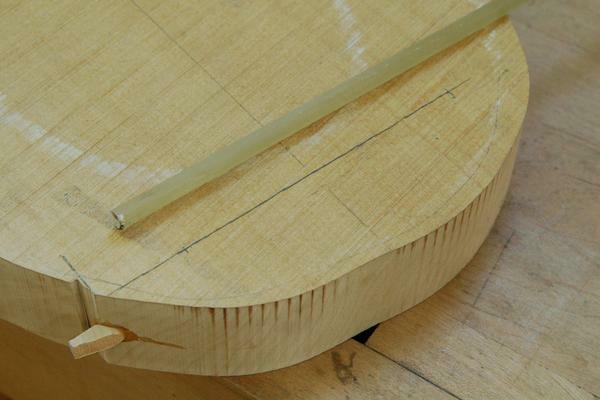 The missing hoop issue is probably common because the hoop was made from one piece of lime; the grain direction in the area of attachment makes the wood weak there. So, we need to consider about how to make a strong new hoop but still following the original method. 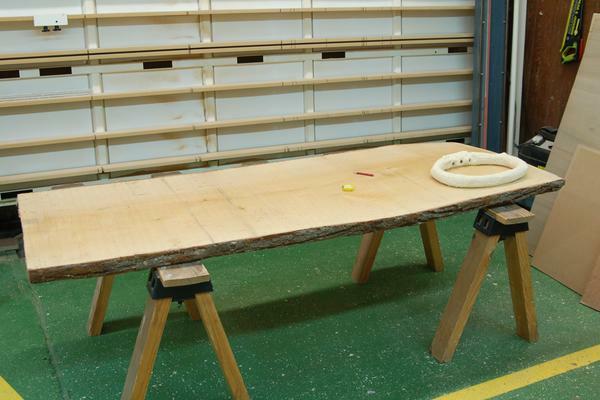 I cut out a 5cm-thick piece of lime wood with a jigsaw and planed the bottom side of the plank. 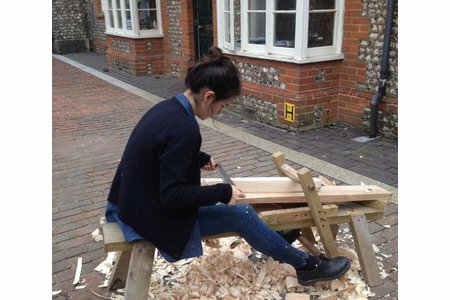 A plunk of lime wood and a model. Before carving the hoop we inserted two glass fiber dowels to strengthen the new hoop. Then I started carving, which is most fun part but also quite difficult. 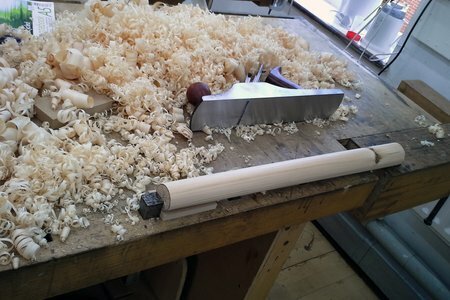 I roughly carved the outside of the hoop with a large-size gouge and thought out where I can put some knots for effect. Later I made two holes on the plank for sawing the center big oval hole using a jigsaw. I carved inside of the hoop with same gouge. Before carving the details I needed to drill two holes for securing it on the original carved trunk. I measured the angles of the original screws and drilled two holes at different angles just like the original ones. Carved roughly and drilled two holes. 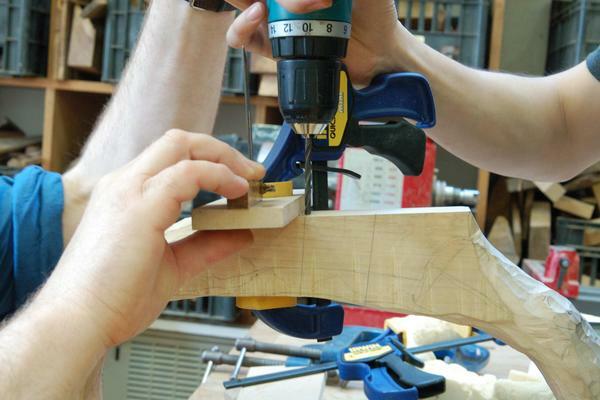 Sawing the center oval hole. Making two holes for securing the hoop. 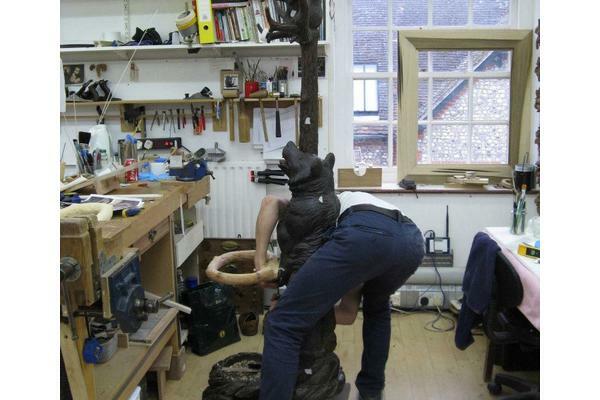 Checking the balance between the hoop and original trunk. Finally, I carved more details on the new hoop. This is a short sentence but the detail carving took three days. Detail carving with unusual position. The whole painted surface was covered with whitish dust. We removed the dust with white spirit and brushes, then we colored the new patches, the hoop, and areas where the finish came off with Vandyke crystals (water-based dye). 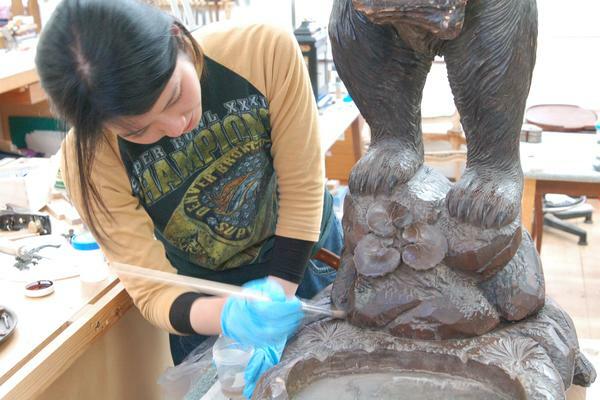 Then we waxed these areas with brown-colored wax, and the umbrella stand was finished. Applying white spirit on the dusty areas. After treatment: The gaps were filled with veneers and pieces of lime wood. 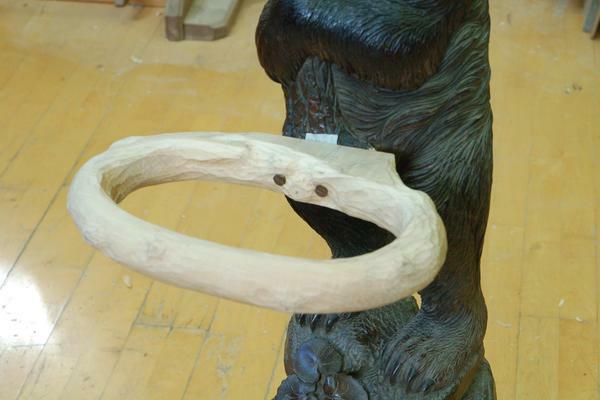 After treatment: Carved and colored hoop with details of same style. 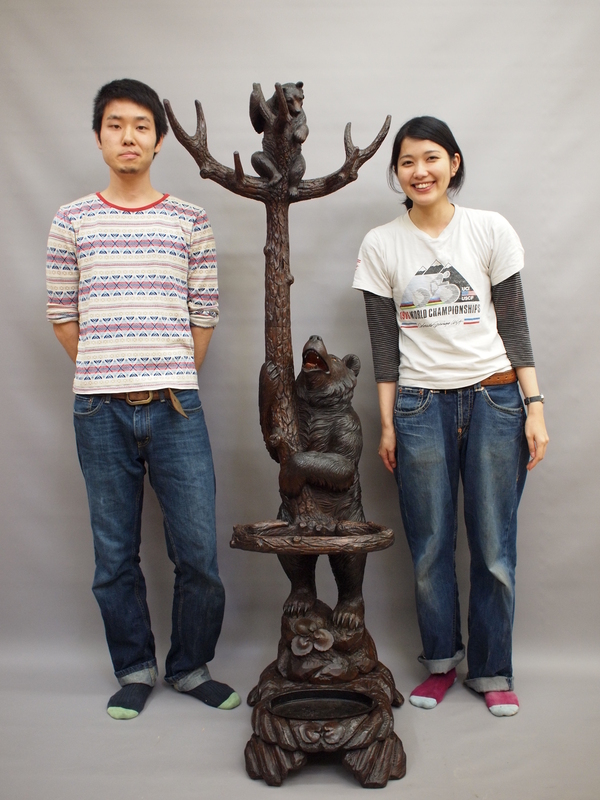 After treatment: A completed object and two good Japanese carvers.